I think we’ll start things off this week with a hearty congratulations. Last night, 8th grade West End Middle Prep math teacher Cicely Woodard was recognized by the TNDOE as the Middle School Teacher of the year, reaffirming something those in MNPS have known for a long time. I’ve often heard parents at Eakin ES, the feeder school to West End MS, say that they are excited by the prospect of their children getting Mrs. Woodard as a teacher, and those who have had her class confirm that anticipation. Mrs. Woodard’s husband is former long-term Maplewood HS principal, and current Number 2 out in Maury County, Ron Woodard. I know Ron is extremely proud of his wife, and this is a great honor for the Woodard family. I’m going on record as saying it won’t be too many years before Mr. Woodard is up for Tennessee School Superintendent of the Year. Yeah, I said it. If you are one of those folks out there talking about her “lack of power” and her “over stepping her bounds,” you might be reading her lack of immediate action as validation for your position. I wouldn’t. Action is coming. McQueen has no option, I believe, other than to issue a strong, decisive response that, unfortunately, inflicts some pain. You see, she’s got Chattanooga sitting on the sideline watching all this unfurl. McQueen, for good or bad, is in the process of bullying Hamilton County Schools (HCS) into participating in the new concept of a partnership district. HCS has, to date, been less than thrilled with this option offered by the state, and any sign of weakness may result in their bolting from the process. 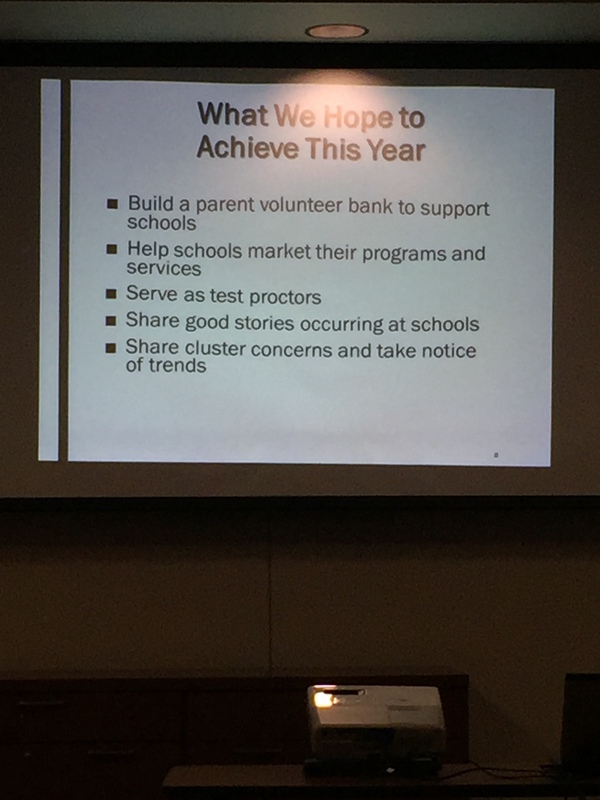 Last week, the TNDOE was able to use a big stick to persuade HCS to continue forward with talks to form the partnership zone. That commitment was in question all the way up until the actual vote. The only reason it went forward was because HCS thought they had no other options. But let them see both Nashville and Memphis start succesfully bucking the TNDOE, and you watch the options that start to spring up as the fear dissipates. Nope, McQueen is bringing the hammer. The only question is what is that hammer going to look like? Rumors say it might not be a fine. The fact that she’s being very measured in her response should be a source of concern for those involved. Johnson said the implementation of the Opportunity Zone is about making sure that students get what they need immediately. This bears further watching. I’m sure it’s going to get plenty interesting. Back when I wore a younger man’s clothes, I had a friend whose band went out on the road opening for Bon Jovi. Upon returning from the first leg, he told me a tale that has always stuck with me. Bon Jovi was managed by the legendary Doc McGee. McGee joined the band out on the road for the first show. Well, that show wasn’t particularly well attended and that didn’t sit well with McGee. He pulled everybody on staff together immediately after the show, divided the remaining dates up among them, and informed them, in no uncertain terms, this was never going to happen again. Every show from here on out was going to be a sellout or somebody was going to be unemployed, and it wouldn’t be him. At this time, Bon Jovi was touring in support of an album that wasn’t being particularly well received. This had no bearing on McGee’s edict. You either put butts in the seats, by whatever means, or put yours in the unemployment line. Miraculously, every show after that was a sellout. I tell this story because I can’t help but think this is going to be the case with the upcoming MNPS Educator Voice meetings, the first of which starts next week. They are designed for MNPS leaders to hear from teachers. But here’s the thing: It’s week nine. Grades are due. Infinite Campus is still not working properly. There has been little effort to actually forge a relationship with most teachers. To get to the meeting, which starts well after school is out for the day, teachers would have to drive to a separate location in their quadrant during rush hour traffic. There has been no evidence presented to demonstrate that they won’t just be props in a staged publicity event. They’ve already sacrificed enough personal and family time in order to implement the district leadership’s poorly designed and communicated plans. In other words, what is the impetus for teachers to go to these meetings? I’m getting an unexpected answer though: anger. The amount of work added to teacher’s plate without clear direction has lit a fire that’s threatening to become a conflagaration. Lesson plan’s that took weeks to plan suddenly have to be abandoned and new ones created because previous plans didn’t align with the districts poorly communicated vision. Grades painstakingly entered in Infinite Campus randomly disappear and have to be re-entered. These are just a few examples of what’s got teachers so angry that papering the house may not be necessary. In talking to several people across the district with daily access to teachers, I’ve come to believe that I may be underestimating the level of anger currently being felt by teachers. I knew y’all were angry, but I just assumed that teachers would do what they always do, which is to internalize the anger, shut the doors, and teach to best of their ability. Now I’m getting the drift that there may be something else in the air, that teachers may be reaching their boiling point, and I’m not going to lie and say it doesn’t thrill me. Without their voices nothing will change. I firmly believe that the Scope and Sequence for literacy combined with poor communication and direction from district leadership has put our teachers and principals in an untenable position. A position that is so severe, I am not sure we have a moral right to ask them to navigate it. Teacher’s already sacrifice so much in order to provide the best educational experience possible for all children. These sacrifices affect their marriages, their relationships with their own children, and their health and now we are demanding more. At what point do we realize that we have morally crossed a line and have raised the bar too high? I liken it to football players and concussions. At some point society realized that concussions among NFL players had grown to epidemic portions and that it was having a negative impact on their lives away from the game. As a society we knew the game had to be made safer and through rule changes and new safety equipment it has become much safer. The same needs to happen with teaching before we destroy all of our best players. I’m well aware that all of that sounds hyperbolic, but believe we reacher a stage that things need to get a bit hyperbolic because nobody is listening. Some of the policies currently being implemented – homework, grading, literacy – are not rooted in currently recognized best practices. I can’t grasp for the life of me why we are implementing a literacy plan that utilizes research from the late 90’s as primary justification. Yet, here we are. So much of the required texts, though the district argues that they are just recommendations despite being labeled required texts, are unavailable or inappropriate. Somebody needs to communicate that to district leadership. That message needs to be communicated by those who know best, those who take care of our kids daily, those who have been largely ignored – our teachers. Here’s hoping that Doc McGee’s strategy won’t be needed and teachers show up of their own volition demanding to be heard. Have any statements even remotely similar arisen from MNPS meetings? Not that I’ve heard. 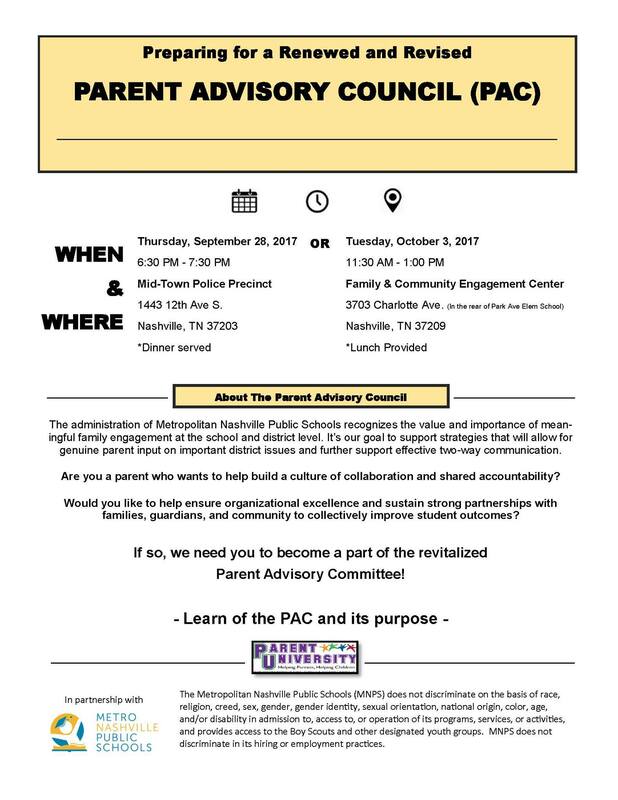 MNPS is making an effort to get the official Parent Advisory Committees back up and running. Yesterday they held the first of two orientation meetings. I welcome this revival, but based on some of the slides… I’ve got some questions. Parent question: Do we can have a budget for the PACs? Answer: No. But we do have a director of schools who is willing to help us. The next meeting is on October 3rd at 11:30 AM over on Charlotte Avenue. Nashville-based blogger Vesia Hawkins has an interesting piece out this week. If you haven’t read it yet, you should. If you haven’t read my piece from earlier in the week on the drinking water in MNPS schools, you need to read that one as well. Check out the latest from the Equity and Diversity University for learning opportunities during Hispanic Heritage Month. 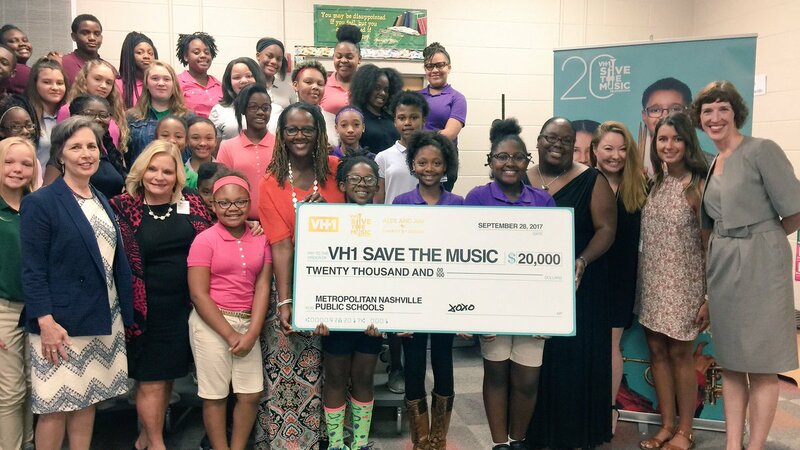 Congratulations to IT Creswell MS for being awarded an amazing music grant from VH1’s Save the Music! 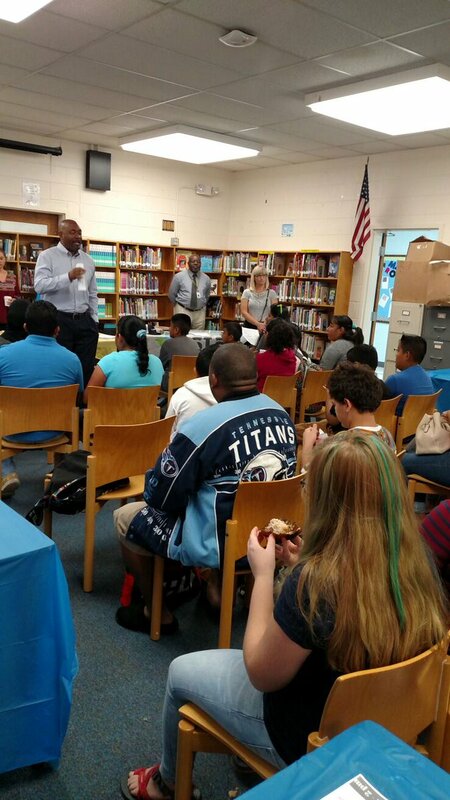 McMurray MS had standing room only this morning for its parent meeting. Way to represent! 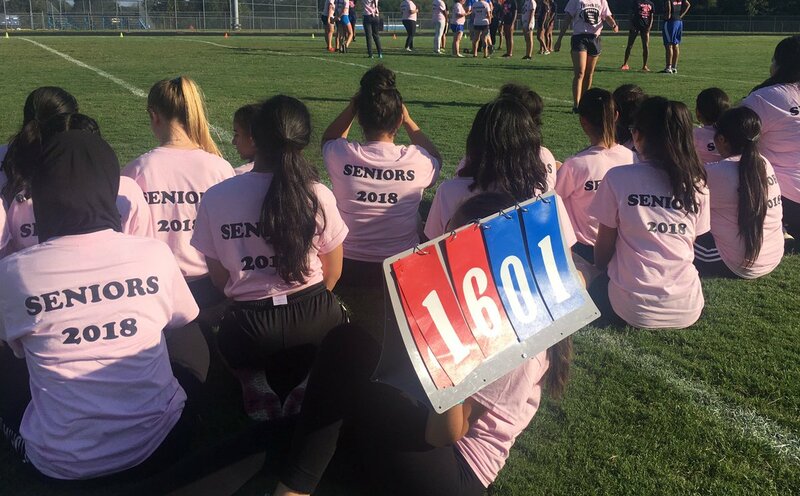 The football Powder Puff tradition continued this week at Antioch HS. The senior girls recorded a victory over the junior girls. Rah! Rah! Boom! In case you were wondering, October 5th is a full day of school. October 6th is a teacher work day. Fall break is October 9-13. And everyone returns to school on Monday, October 16. I thought we’d have a little fun with the poll questions this week. The first one is about the upcoming Educator Voice meetings. If you are a teacher, I’m curious to what your approach as a teacher will be. The second question revolves around the many different consultant groups we now have working in our district. Who’s your favorite? The last question reflects back on the many people who have left the district over the last 13 months. Who do you miss the most? Who do you wish was still here? That does it. You can email me at norinrad10@yahoo.com. Make sure you check out the Dad Gone Wild Facebook page. Previous NO. THE WATER AT MNPS SCHOOLS IS NOT SAFE. The meeting time to hear “Teacher’s Voices” really bothers me. In fact, I don’t think our leadership wants to hear from teachers at all. I teach high school. I get up at 5 a.m. and teach until approximately 2:30, although I often stay until 3:00, tidying up my room, making photocopies, calling parents, etc. A meeting at 6:30 is way too late for me. Sorry, I am too tired to attend. Traffic is heavy and would take me 50 minutes to get to the meeting. No thanks. I haven’t had a real pay raise and gas costs money. This is the equivalent of asking somebody who works until 5 PM to come to a meeting that is from 9 -10:30 PM. This is incredibly insensitive and just shows how out of touch leadership is with teachers.